Compare the structure and function of organs in the digestive system. Activity: Constructing a Digestive System Model - Follow the instructions to create a model of the system. Also includes other worksheet activities to help understand the organs and functions of the digestive system. Body Basics Article: Digestive System - All you need to know about the digestive system, including an Interactive Diagram that provides information over the various structures as you roll your mouse over each one. Crossword Puzzle: Digestive System - Print off the puzzle for students to complete the crossword puzzle. Digestion - Function and structures of the digestive system. Digestive System - Learn about the anatomy, functions and more. Includes a self checking quiz as well. Digestive System Activities - Numerous interactive activities, quizzes, demonstrations, etc. Digestive System Lessons and Activities - A variety of handouts, activities, presentations, lessons and more. Food and the Digestive System - Lesson plan with a purpose "to learn about the digestive system. To begin to explore where nutrients come from, as well as their importance for particular tasks in the body." Functions of the Digestive System - Digestive system chapter that includes vocabulary, activities and questions to check that the objectives were learned. Introduction to Digestion and Nutrition - Module with a variety of lessons on the structure and function of the digestive system as well as other topics related to digestion. Learn the Structures - Free printable diagram for students to label and color the various structures of the digestive system. Lesson Plan: Digestive System - "The purpose of this lesson will be to help students understand the function of the digestive system and how it relates to the well-being of the body as a whole." Lesson Plan 2 - "This lesson is designed to help students learn the structure and function of the organs in the digestive system. They will use the Internet to research the information and do classroom experiments to solidify their knowledge. Organs of Digestion - Interactive animation explaining the function of the digestive system. A self checking quiz follows the animation to see that the concepts are understood. Organs of the Digestive System and their Functions - Find out about the organs that contribute to the breaking-down process of food. Practice Test: Digestive System - 57 question test on the organs, functions, etc. of the digestive system. Answers provided on the last pages. Structure and Function of Digestive System - Overview of the complex system known as the digestive system. The Digestive System - From WebMD. Find out what happens to food as it makes its way through the digestive system. Tour the Digestive System - Learn what each organ does one by one. Worksheets: Digestive System - Variety of worksheets for learning the various organs and functions of the digestive system. Contrast mechanical and chemical digestion. Chemical and Mechanical Digestion - The difference in how food is broken apart to be absorbed through the intestinal walls. Chemical vs. Mechanical Digestion - Difference between the two digestions. Digest This! - Numerous activities and lessons. Activity #1 topic is mechanical and chemical digestion. Digestion Lesson Plan - Objective is to learn how our food is broken down mechanically and chemically. Lesson: Mechanical and Chemical Digestion - Classroom activity examining both processes and observe how enzymes affect the rate of chemical digestion. Mechanical Digestion: The Initial Breakdown of Digestion - Class activity to see how mechanical digestion aids chemical digestion. Tales from the Tummy - Lesson involving creative writing by the student with an objective of describing each organ in the digestive system and its function as well as distinguishing between chemical and mechanical digestion. What is Mechanical and Chemical Digestion? - From eHow.com. Also includes information on the "Differences Between Chemical and Mechanical Digestion"as well as instructions on "How to Compare Chemical and Mechanical Digestion." Why is it Important to Chew? - Classroom activity to assist in learning why and how particle size aids in effective digestion. Trace a selected food through the alimentary canal. A Journey Through The Alimentary Canal - The journey of a chicken sandwich as it contains all the macro nutrients which will need to be digested. Diagrams included. Animated Digestion - Impressive interactive animation showing the digestion process. Pick a food to eat and click on each stage of the digestion process to see the explanations of what is occurring. Canal Movements - Description of the two movements, mixing and peristalsis, the alimentary canal makes to move food along. Digestion Lesson Plan - Objective includes tracing a piece of food through the alimentary canal. Digestive System Slides - PowerPoint slides outlining the general characteristics of the alimentary canal with detailed diagrams indicating the path which food travels. Quiz: Digestion - 45 question quiz plus 13 question for identifying structures of the digestive system. Quiz includes questions about the passage of food through the alimentary canal, answer key provided. Web Tutorial: Digestion and Absorption of Food - Explains the role of each part of the digestive system including the passage of food through the alimentary canal. The Alimentary Canal - PowerPoint from worldofteaching.com. The Bottomless Pit - Describes in detail the functional anatomy of the alimentary canal. The Digestion of Food - Detailed outline of the chemical breakdown of food. Identify the enzymes and biochemical reactions that facilitate digestion. Digestive Enzymes - Video providing detailed information on enzymes and different parts of the gut that produce enzymes. Video is interactive and students must click at various parts to continue hearing the information. Digestive Enzymes 2 - Biology lesson on enzymes and how they work. Digestive Enzymes Practice Test - Multiple choice questions; self checking. Enzymes - Description of the characteristics, uses and how enzymes work. Enzymes and Digestion - Information on enzymes: how they work, where they are produced and the various uses of them. Enzymes and Digestion - Interactive presentation describing enzymes. Enzymes and Digestion Activity - Interactive video detailing how enzymes help respiration and digestion. Enzymes and Digestion Quiz - Multiple choice quiz on enzymes and digestion. Self checking. Enzymes Involved in Digestion - Outlines the specific enzymes and also provides a summary chart for them. Explain how the products of digestion are absorbed. Absorption - The four mechanisms of absorption. Absorption of Food - Describes the GI process and the digestion of food. Digestion - Diagrams and descriptions of digestive process. Digestion and Absorption - Explanation of how food is absorbed. Practice Test - Multiple choice questions on digestion, absorption and transport. Self checking. The Digestion Process - How the normal digestive system works. Absorption in the small intestines. Includes quiz questions. The Human GI Tract - Very descriptive outline explaining the process of digesting food including absorption. Web Tutorial: The Digestion and Absorption of Food - Tutorial showing how carbs, proteins and fats are digested; how nutrients are absorbed from food; and how wastes are eliminated. Includes a lot of interactive activities including a pre and post test. Where Did That Sandwich Go? 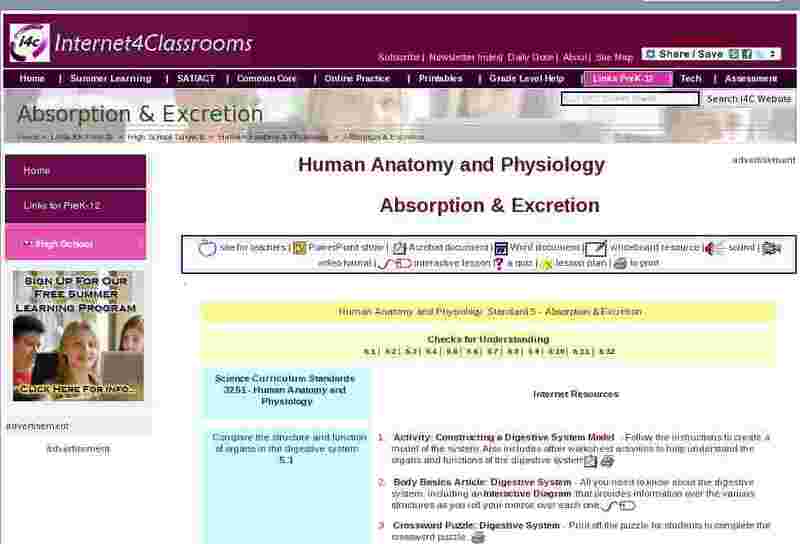 - Lesson plan explaining digestion and absorption. Includes quiz. Compare and contrast the male and female urinary systems. Genito-Urinary System - Interactive online practice of the upper and lower urinary tract. Has diagrams of both the male and female lower urinary tract; click on each label of the diagram to read more about the function of each body part. Label the Diagram - Interactive diagram. For each green dot, drag the correct label to identify the part. Lower Urinary System - Development of the male and female urethra. Male Urinary System - YouTube video with narration and diagrams describing the system. Male/Female Urethra - From Wikipedia. Urinary Anatomy - Description of what makes up the urinary system, including how it works. Urinary System Structure and Function - Video detailing the urinary system. Urinary System Unit - Lesson plans with outlined information on the urinary systems. Includes activities for students also, such as matching worksheets and diagrams that should be labeled. Explain how the kidneys act to maintain homeostasis. Excretion and Homeostasis - Lesson plan for teaching about the urinary system and the structures and function of the kidneys. Homeostasis: The Steady State - Lesson and activities. Kidneys and Homeostasis Lesson - Explains the functions of the kidney and includes activities and quizzes. Lesson: The Urinary System - Overview of lesson with a focus on the kidney and the main function of the kidney. Includes diagrams of the kidney and urinary tract as well as activities for students to do. Maintaining the Excretory System - Lesson, lab, interactive active and hand-in assignments. Quiz on Urinary System #1 - Focus is on kidneys. Click a question card and then click the answer choice card that best fits the question. Recommended for 7th - 12th grade. Quiz on Urinary System #2 - Click a question card and then click the answer choice card that best fits the question. Recommended for 7th - 12th grade. The Urinary System - Detailed information explaining the anatomy and role of the kidney. Urinary System - From Wikipedia. Emphasis on the kidneys and their role. Urinary Tract: Kidney - Slides detailing the function of the kidneys in the urinary system. Water and the Urinary System - The importance of water and the kidneys for our body to function. Your Kidneys - Everything you need to know about the kidneys, including an interactive diagram. Identify the parts of a nephron and describe how they assist in urine formation. Function of the Nephron - Video identifying the parts of the nephron and how it pertains to urine formation. Nephron - Description, diagram and details about the nephron and kidney. Structure of the Nephron - Worksheet for students to color the diagrams labeling the parts of the nephron. Also contains information explaining the function of the nephron and has questions at the end. The Nephron - YouTube video with detailed graphics and narration of the parts of a nephron as well as the role of the nephron. The Urinary System - Detailed information describing nephrons with a diagram identifying the parts. Urine Formation - Video detailing the formation of urine and begins with the nephron. Urine Formation in the Nephron - 5 page lesson with interactive activities. Includes a module with hand-in assignments. Describe the composition of urine. Describe a countercurrent mechanism and explain how it concentrates urine. Discuss the importance of water and electrolyte balance. Describe how body temperature is regulated.